Absolutely love this sparkley playdoh... We will have 7 girls between the ages of 8-3 during the holidays. They will think this is sooo cool. Thanks for sharing! Where did you find your jam jars? I bought those jam jars at my local Fry's grocery store. Most grocery stores have a small selection of canning supplies. This looks great! How long does this stuff last? Does it need to be refrigerated? I've never refrigerated it, and the batch I made for my daughter's preschool is still in great shape a month later. But since it's not full of preservatives, I'm sure it does have a shelf life. A tiny bit of glitter escapes during play, but for the most part, it really stays contained within the playdough! Thank u for the recipe & glitter idea. My first batch of playdough over Thanksgiving weekend was a major bust. Trying this one today. How big are you jam jars? I have standard medium-size mason jars and am trying to figure out if I want to split the recipe in half to make two colors or if it wont be enough to fill them both. Made this today with the little guy. It turned out great! Thanks for sharing! Love it!! The playdough is fantastic!! My kids and I made it in three different colors and put them into the plastic baby jars (we soaked them in bleach water overnight to take the yellow stains out). Then we covered the name "Gerber" on the lid with a cute label in the color of the play dough saying "Sparkly Play Dough" using a cute free font found online (Fontspace.com, font name Fontdinerdotcom Sparkly). It just looks so adorable! They are selling it in a neighborhood kids market. They also feel really good about recycling the baby jars that otherwise would be in the trash. :-) Thanks for the great recipe. I'm wondering how you decorated the lid of the jar to match the playdough? Please share that tip! This is a wonderful idea! It would make a great gift for an older sister or brother if you were bringing a meal to a family with a new baby. Just be sure to warn everyone that it is made with flour so it is not gluten free. Thanks for sharing! I am currently hosting a party called "50+ Ways to Deck the Halls with Glitter". I would love for you to link up this project! 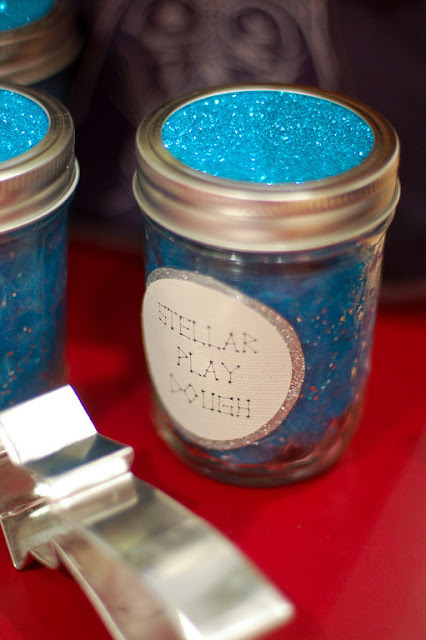 What a great idea, what kid doesn't love playdoh with glitter! I made a batch yesterday and it is way too sticky - sticks to hands, surfaces, pretty much everything but plastic wrap. Added more flour but it got worse. Any ideas on how to remedy this? My best guess is to cook it longer. It's rather gooey until it's cooked enough. At this stage, you could try microwaving it to see if that helps. I have no idea if it will, but that's what I'd try!